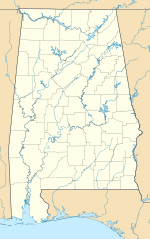 Northwest Alabama Regional Airport (IATA: MSL, ICAO: KMSL, FAA LID: MSL) is a mile east of Muscle Shoals, in Colbert County, Alabama. It is owned by the counties of Colbert and Lauderdale. The airport sees one airline, subsidized by the Essential Air Service program at a cost of $2,603,365 (per year). The National Plan of Integrated Airport Systems for 2015-2019 categorized it as a non-primary commercial service facility. The Federal Aviation Administration says it had 2,345 passenger boardings (enplanements) in calendar year 2013, a decrease of 43.6% from 4,160 enplanements in 2012. Formerly, the airport operated as Muscle Shoals Auxiliary Field. The airport opened as Muscle Shoals Auxiliary Field opened in February 1940, but in 1942 it was taken over by the United States Army Air Forces as a World War II pilot training military airfield. It was assigned to the AAF Flying Training Command, Southeast Training Center (later Eastern Flying Training Command) as a basic (stage 2) pilot training airfield. Pilot training at the airfield apparently ended on May 30, 1944, with the drawdown of AAFTC's pilot training program. The airfield was returned to civil control at the end of the war. Until summer 2009 Muscle Shoals was served from Northwest Airlines' hub in Memphis by Northwest Airlink (Mesaba Airlines turboprops). After Northwest was acquired by Delta Air Lines, service was transferred to Delta's hub in Atlanta. This has seen increased passenger numbers and less market leakage to nearby Huntsville Airport. Despite the increase in enplanements, on November 23, 2010, Delta announced that it would not re-apply for the Essential Air Service subsidy to provide service between Muscle Shoals and Memphis. The cited reason was the retirement of partner Mesaba's Saab 340 fleet. Under federal law, Delta Connection must continue service to Muscle Shoals until a replacement carrier is found. In 2011, Air Choice One, a Missouri-based carrier, submitted a proposal to the US DOT to serve Muscle Shoals with flights to either Atlanta, Nashville or Memphis. Pending acceptance of the proposal, the airline was planning to begin flights in as little as 30 days. This airline never commenced service to Muscle Shoals. Eastern Airlines stopped at Muscle Shoals from 1947 to 1964. Southern Airways Douglas DC-9s flew nonstop to Atlanta and via Huntsville, and Southern Martin 4-0-4s flew to Memphis. Southern merged with North Central to form Republic, which continued at Muscle Shoals with DC-9-50s to Atlanta and with Convair 580s and Metroliners to Memphis. Republic was acquired by Northwest Airlines which ended jet flights to Atlanta but started Northwest Airlink service to Memphis with Jetstream 31s. Northwest Airlink replaced the Jetstreams with larger Saab 340s before all service ended. Beginning in October 2012, Muscle Shoals was served by Silver Airways with two daily flights to Atlanta. Due to constant delays and cancellations, ridership declined to about 3 passengers per day under Silver, below EAS guidelines. Silver ended service to Muscle Shoals in October 2014. SeaPort Airlines announced it would take Silver's place in the Fall of 2014,SeaPort began daily flights to Nashville and Memphis on January 12, 2015. Seaport service lasted less than one year and ended on October 20, 2015. The US Department of Transportation awarded the EAS contract to Boutique Air. The airline contracted to operate 24 weekly returns to Atlanta and/or Nashville. The contract will run from February 1, 2016 through to February 28, 2018. Boutique Air service began February 24, 2016. The airport covers 640 acres (259 ha) at an elevation of 551 feet (168 m). It has two asphalt runways: 11/29 is 6,694 by 150 feet (2,040 x 46 m) and 18/36 is 4,000 by 100 feet (1,219 x 30 m). In the year ending November 30, 2012 the airport had 44,490 aircraft operations, average 122 per day: 94.4% general aviation, 1.6% airline, 0.6% air taxi, and 3.4% military. 62 aircraft are based at this airport: 61% single-engine, 23% multi-engine, 6% jet, and 10% helicopter. ^ a b c FAA Airport Master Record for MSL (Form 5010 PDF). Federal Aviation Administration. Effective March 5, 2015. ^ "IATA Airport Code Search (MSL: Muscle Shoals)". International Air Transport Association. Retrieved June 6, 2014. ^ "2015-2019 NPIAS Report, Appendix A" (PDF, 7.89 MB). National Plan of Integrated Airport Systems. Federal Aviation Administration. September 30, 2014. ^ a b "2013 Enplanements at All Airports (Primary, Non-primary Commercial Service, and General Aviation) by State and Airport" (PDF, 1.05 MB). CY 2013 Passenger Boarding and All-Cargo Data]. Federal Aviation Administration. June 23, 2014. ^ Patterson, Jerrita (November 23, 2010). "Delta Airlines Opts Out of Servicing the Muscle Shoals Airport". WHNT News 19. ^ McLaughlin, Budd (October 14, 2011). "Missouri air carrier proposes serving Northwest Alabama Regional Airport". The Huntsville Times. ^ Corey, Russ. "Regional airport pursues exit of airline". timesdaily.com. Times Daily. Retrieved 10 October 2014. ^ "Boutique Air secures Muscle Shoals, AL EAS contract". ch-aviation. December 16, 2015. ^ "Boutique Air announces new spring schedule for Muscle Shoals" (Press release). Boutique Air. February 22, 2019. Retrieved February 26, 2019. ^ a b "Muscle Shoals, AL: Northwest Alabama Regional (MSL)". Bureau of Transportation Statistics (BTS), Research and Innovative Technology Administration (RITA), U.S. Department of Transportation. December 2014. ^ "2005 Primary, Non-primary Commercial Service, and General Aviation Airports with Enplanements (by State)" (PDF, 200 KB). CY 2005 Passenger Boarding and All-Cargo Data. Federal Aviation Administration. Fall 2006. ^ "2006 Primary, Non-primary Commercial Service, and General Aviation Airports with Enplanements (by State)" (PDF, 250 KB). CY 2006 Passenger Boarding and All-Cargo Data. Federal Aviation Administration. Fall 2007. ^ "2007 Primary, Non-primary Commercial Service, and General Aviation Airports with Enplanements (by State)" (PDF, 187 KB). CY 2007 Passenger Boarding and All-Cargo Data]. Federal Aviation Administration. September 26, 2008. ^ "2008 Primary, Non-primary Commercial Service, and General Aviation Airports with Enplanements (by State)" (PDF, 1.0 MB). CY 2008 Passenger Boarding and All-Cargo Data. Federal Aviation Administration. December 18, 2009. ^ "2009 Primary, Non-primary Commercial Service, and General Aviation Airports (by State)" (PDF, 891 KB). CY 2009 Passenger Boarding and All-Cargo Data]. Federal Aviation Administration. November 23, 2010. ^ "2010 Primary, Non-primary Commercial Service, and General Aviation Airports (by State)" (PDF, 189 KB). CY 2010 Passenger Boarding and All-Cargo Data]. Federal Aviation Administration. October 4, 2011. ^ "2011 Enplanements at Primary, Non-primary Commercial Service, and General Aviation Airports (by State)" (PDF). CY 2011 Passenger Boarding and All-Cargo Data]. Federal Aviation Administration. October 9, 2012. ^ "2012 Enplanements at All Airports (Primary, Non-primary Commercial Service, and General Aviation) by State and Airport" (PDF). CY 2012 Passenger Boarding and All-Cargo Data]. Federal Aviation Administration. October 31, 2013.